A couple of nights ago, I joined a food and wine pairing event at The Social Cebu and I realized that this restaurant in a mall is actually an amazing place for wine and food here in Cebu. Ever since I worked in a wine a company a few years ago, my favorite alcoholic drink has become wine. In Cebu, I rarely drink wine because my friends would rather have some beer. It is quite refreshing to know that there are people who would exert an extra effort to introduce to Cebuanos the wonderful word of wines. For me, one of the best places for food and wine here in Cebu is definitely The Social. Last Friday, several bloggers and some regulars of The Social Cebu were treated to an amazing 5-course dinner that featured fine California wines from Via Pacifica Selections and some magnificent culinary creations by The Social kitchen led by Chef Rob Leonhardt. We started our wine night with a glass of Pine Ridge Chenin Blanc + Viognier which served as our reception wine. The blend was really easy to drink. I think I had at least 2 glasses of this refreshing wine from Napa Valley. It was really crisp and it had good acidity. It was mouthwatering, which made it a perfect wine to open up our palates. After minutes of chitchat with David Duckhorn, the man behind Via Pacifica, and Chef Rob, we settled on our seats for our dinner. I was seated with Chef Rob's wife and some of their friends. For the opening salvo, Chef Rob prepared a fantastic salad dish that had beets, goat cheese, toasted pistachio, pomelo, aged balsamic vinegar, and basil. The salad looked terrific and it could really be perfect for Valentine's Day because of its color. I never enjoyed eating beets as much as that night. The pistachios brought out some amazing aroma and its hard texture balanced the softness and chunkiness of the beets. Acidity brought by the pomelo and balsamic vinegar was pleasant. The unoaked Chardonnay from Edna Valley was minerally, fruity, and had a good acidity. The pairing was a good match as the fruitiness of the Chamisal "Stainless" Chardonnay gave the beets some character. As I said earlier, I never had beets this good. The next dish was like a play of our local kinilaw and it had Smoked Lapu-Lapu, organic Japanese tomato Consomme, Calamansi, Seaweed Sorbet, and Nori Salt. The dish pleasantly reminded my tongue of the sea. The 2012 Oberon Sauvignon Blanc Napa Valley was half-dry with hints of citrus. It really elevated the flavors of the greens and my palate was bursting with an assortment of flavors with the pairing. The braised USDA short ribs had corn puree, black truffle butter, blackened onions, parmesan, and potato galette. This dish was magical and I really told Chef Rob that they should put this on the regular menu. The meat has that melt in your mouth goodness and it was extremely delicious. My mind was saying "Kalami!" several times when I was eating this beef dish. The Duckhorn family is actually like the royalty of merlot in the United States. The wine is David Duckhorn's family pride and it expectedly it did not embarrass our host. The wine was complex and it was quite bolder than a typical merlot. The tannin was polished. If this dinner were a play this pairing would be its climax. It was an experience that I want to feel more often. I really felt full but we were not done yet. 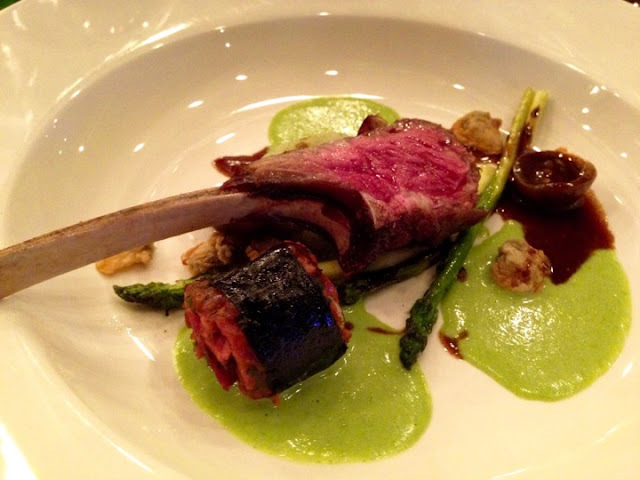 We were given each a slice of a rack of lamb with Mayer lemon glazed asparagus, slow cooked lamb nori roll, and crispy clams. The plating was impressive and I love the play of flavors. Putting Clams with lamb was a unique version of Surf and Turf. The lamb nori roll was an interesting piece. The cabernet sauvignon smelled so good. I really loved the aroma of the 2012 Rodney Strong. It was a wine that was really made for eating meat. It was an enjoyable combination that I was able to finish it all despite feeling full after the third course. We capped our dinner with an interesting dessert paired with a California Zinfandel. Every spoonful of the souffle was enjoyable. I did not even put much of the salted caramel sauce because I was already happy with its sweetness. The pandan ice cream added a Filipino touch and a contrast of temperatures. Indeed, the wine was powerful which complements the intensity of the dessert. By then, I was really smiling because I had just one of the best meals in years. We finished our meal but the fun did not stop as The Social metamorphosed from a fine dining place into a party joint. The Social Cebu turned into a different type of animal as we were singing songs as if we were in a karaoke bar. We had some beer, we drank some tequila shots, and we had excellent conversations. I do not think you can find a place as versatile as The Social here in Cebu. It is a restaurant/sports bar/pub/all-day breakfast/date place. I had a fantastic time eating and drinking everything that was offered in that wine and food pairing. Chef Rob gave me their Valentine's menu and I think I have found the place where I want to go this Valentine's Day. I would certainly bring Steph at The Social today or sometime in the near future. As for Via Pacifica, I think the wines that they offer will definitely be accepted in the market. As long as they collaborate with restaurants like The Social, they will gain some loyal following. Their wines might not be cheap but the wines that David will be bringing in are typically rated 90 and above in Wine Spectator. I look forward to them setting a shop here in Cebu! The Social Cebu is located at the 4th Level of the New Wing of Ayala Center Cebu. Food Trip: Ngohiong sa Carlo's Special Ngohiong!